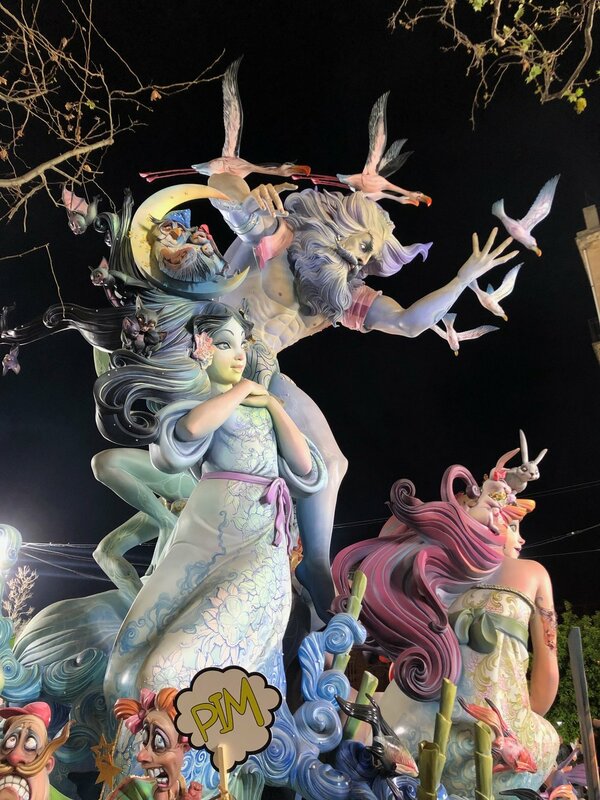 I’ve written before about the many elements that make up Fallas, Valencia’s principle festival, and one of Spain’s big draws. And comparing my pictures from this year with last year’s, I see that I added a few new experiences, but a few were taken away too. 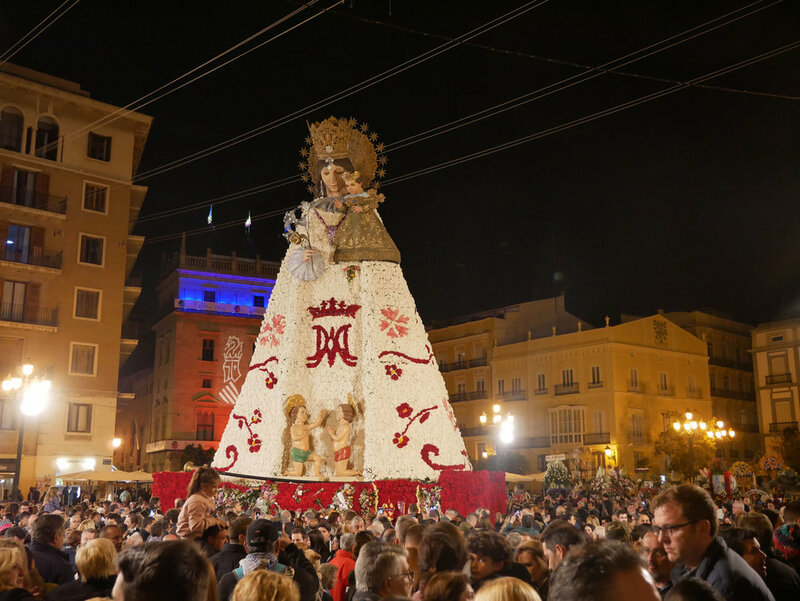 This year, I made it out to the Port of Valencia, to see the “Vertical Mascletà,” a kind of new tradition that kicks off the Fallas festivities at the end of February. It truly was magnificent: it started out with a beautiful fireworks display erupting from behind the Veles e Vents building (designed by David Chipperfield Architects), and then it ended with the “Vertical Mascletà.” Mascletàs are usually strings of firecrackers let out in a plaza or a broad street. Here, they arranged the firecrackers vertically like a giant screen, and they went off from bottom to top. Truly unique. The falleras were out in their splendid dresses. This year I caught a cool picture of a group dancing and celebrating on the street! This was taken from the Torres de Quart old city gates. And how do falleras get around? Jammed in chartered buses! This was a pretty Falla, the Falla Exposición just north of the Turia park. Quite graceful and delicately painted; I also liked how the birds really look like they’re flying. I always look forward to the Falla Corona, which is always a “conceptual,” non-traditional Falla. I didn’t really look into what the theme was, but visually it was a bit dull this year. My favorite baby Falla, the “Falla Infantil,” was that of Falla Plaza del Pilar. It was a fruit theme, with lots of Valencia oranges. Can you spot the orange with the bat wings (the bat being a symbol of Valencia)? Living close to the Turia park, I could also conveniently reach a good vantage point for the fireworks shows, which are nightly from the 15th of March and culminate four nights later in the Nit de Foc. I always like seeing the falleras bringing their flowers for the Ofrenda. Building up the Virgin Mary’s cloak in the Plaza de la Virgen. This year, one big difference was that the famous light shows of two Fallas in Ruzafa basically went extinct. This was part of the light display from last year, at the Falla Cuba Literato Azorin. The lights in themselves were impressive, but then every hour, there would be show with music and the lights changing color and moving in sync. 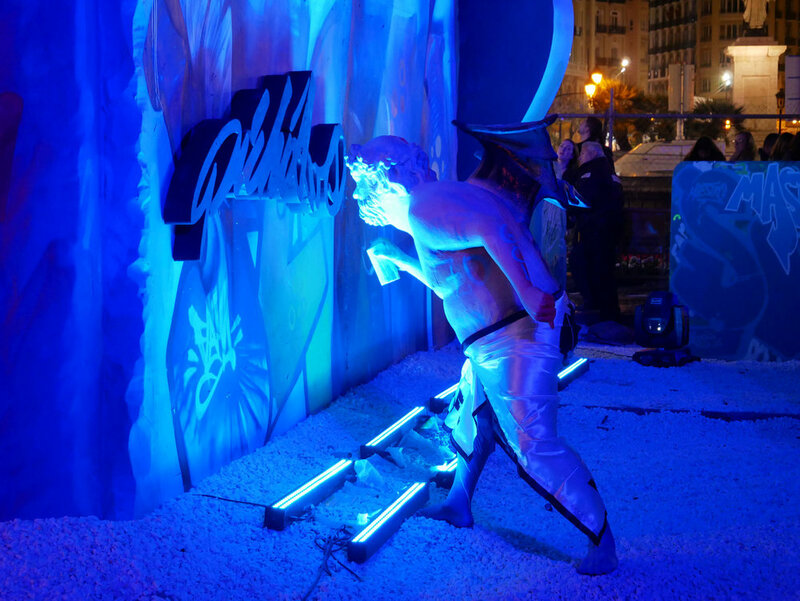 This year, apparently the Fallas were asked to pay for security enhancements to control the crowds that inevitably formed, perhaps concerned with the same threats as at the mascletàs. I guess they decided not to, so they put on very “normal” light displays. The kind one would expect at Christmastime. This year, I finally got to see the Cabalgata de Foc, on the last day of Fallas. Like the Vertical Mascletà in February, this is actually a new tradition - whenever I mention this to a native Valenciano, the never know what I’m talking about! (“Do you mean, the Nit de Foc?” they ask…) This is a parade that goes along Calle Colón to the Puerta del Mar rotunda, and it’s basically a parade of people firing up high-pitched screeching sparkly firecrackers. Honestly, between the daily mascletà, the nightly fireworks shows, and little kids throwing random firecrackers all over the sidewalk, I didn’t need yet another show of explosions. Spanish-style hot chocolate, thickened with corn starch or flour, is the usual accompaniment to buñuelos. These were from a bakery-café near Plaza España. 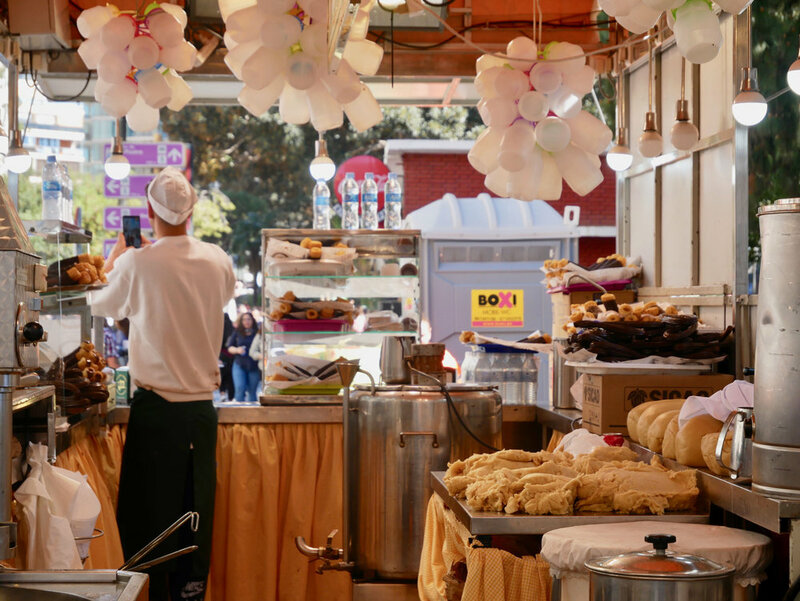 Little stands pop up all over the city selling buñuelos and churros. Here you can see the dough being prepared, and the ceiling hanging with plastic jugs - for takeaway hot chocolate. The buñuelo/churro seller is taking the opportunity to take pictures of a parade led by horses. 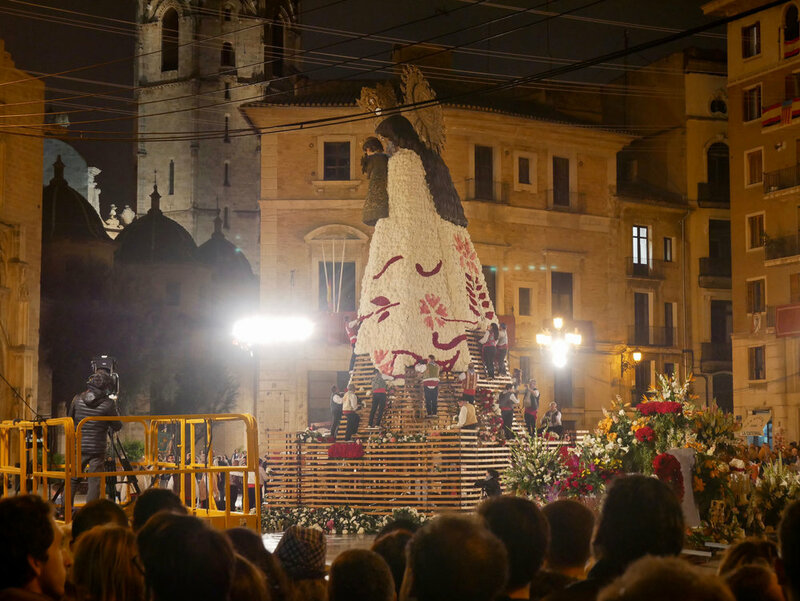 This year’s Falla in the main Plaza Ayuntamiento was best seen at night. Then, it lit up with a surreal glow, showing off the melding of classical form with graffiti. A graffiti artist, Pichiavo, was the invited artist this year. I guess this is him, signing his piece! The “back side,” with the Ayuntamiento (town hall) building in the back. And here is the Falla going up in a final show of fireworks, firecrackers, and plain fire. A lot of Valencianos skip town, because they don’t like the noise and the crowds. I’ve been here several years already, but I guess not enough to make me jaded. 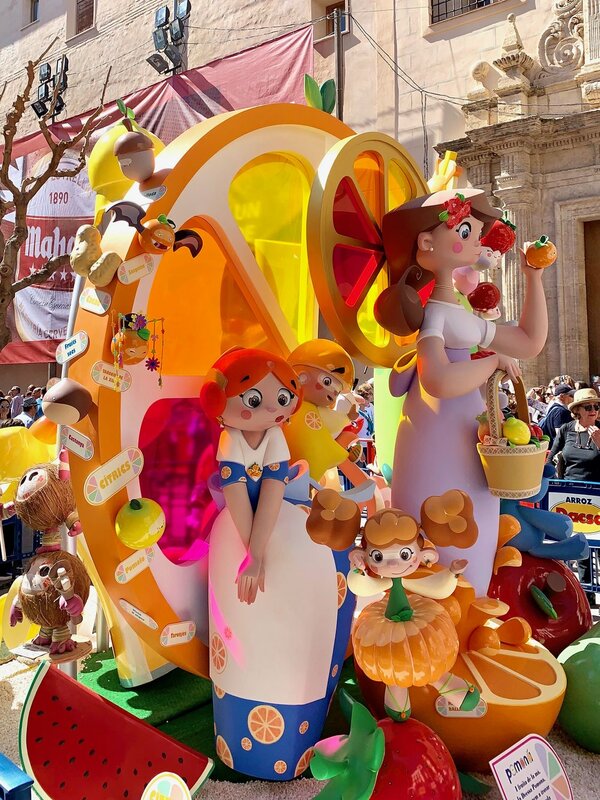 I still look forward to the Fallas, see what the artistas falleros come up every year for their monuments, and enjoy the city with a lot of streets converted to pedestrian-only.